Use your breath to align your body and mind. 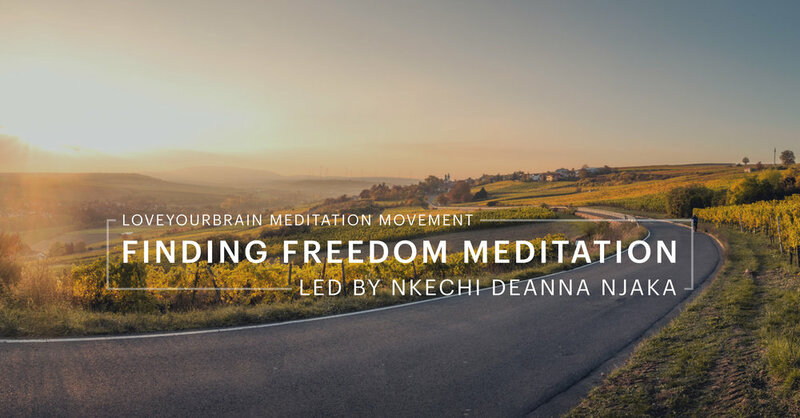 This guided meditation creates the space to find freedom by being present and in the moment. It is a gentle practice and a nourishing experience. By moving away from the past or present, and by choosing to be in the NOW, we reduce our stress and we experience freedom, happiness, and peace. Neuroscience research has shown the amygdala (the center for fight-flight-freeze response), appears to shrink after practicing mindfulness meditation. This primal region of the brain is associated with fear and emotion and is involved in the initiation of the body's response to stress. When we practice mindfulness, we slow down our response to stress and are able to approach challenges with curiosity, compassion, clarity and ease. Enjoy this simple practice that can occur anytime and anywhere to create more room in the body and more freedom in your breath, being and life. Nkechi Deanna Njaka, Msc. is a neuroscientist, choreographer and leads guided mindfulness meditation. She attended Scripps College in Claremont, CA where she majored in neuroscience and dance and went on to complete an MSc. in Neuroscience at the University of Edinburgh. She is the founder of NDN lifestyle studio and the co-founder of Sitting Matters. Nkechi has spent the majority of her life investigating the relationship between the brain and the body and has always felt the significance of their integration. For several years, Nkechi worked as a neuroscientist as well as a professional modern dancer and choreographer. She discovered that mindfulness and creativity are C R U C I A L for sustaining individual and global wellbeing. She currently creates, coaches, consults and teaches in San Francisco, California. A practice to balance your inner strength and letting go create an even deeper sense of steadiness and ease. Explore the power of your mind to unlock your potential. This practice will explore the layers of who you to live more fully and gracefully. A practice to unlock our inner love for all living beings. Explore what is easily available to you -- sounds and sensations -- to cultivate clarity and ease. A Buddhist practice for identifying and relieving suffering.